Lucy, a Toyota HSR, is the newest member of our robot family. 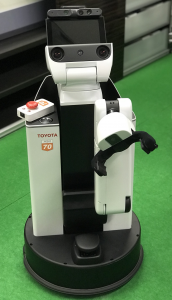 The HSR is developed by Toyota and is meant to be an assistive domestic robot that combines a compact design (the height of the robot is 135cm) with a fairly rich set of sensing and actuation capabilities. In particular, Lucy is equipped with an omnidirectional base that includes a laser scanner and a set of bumper sensors. The robot’s head, which is a controllable joint as well, has multiple sensors: an RGB-D camera, a wide angle camera, a stereo camera, and a microphone array. Lucy’s manipulator has five degrees of freedom, one of which is a linear joint that can extend the robot’s height; this makes it possible to use the robot for manipulating both objects placed on low surfaces (including the floor) and objects on high surfaces (such as shelves). Software-wise, the platform is running ROS; the software interfaces are thus fully compatible with our other robots. 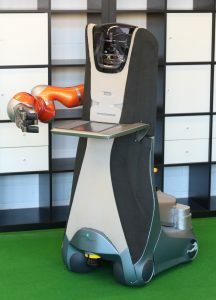 Bonnie is a logistics robot developed in the ROPOD project. The robot has an omnidirectional base made of so-called smart wheels, which have also been developed as part of the project. A Hokuyo laser is used for autonomous navigation and obstacle avoidance. Jenny is based on an omni-wheeled mobile platform called Care-O-Bot 3. 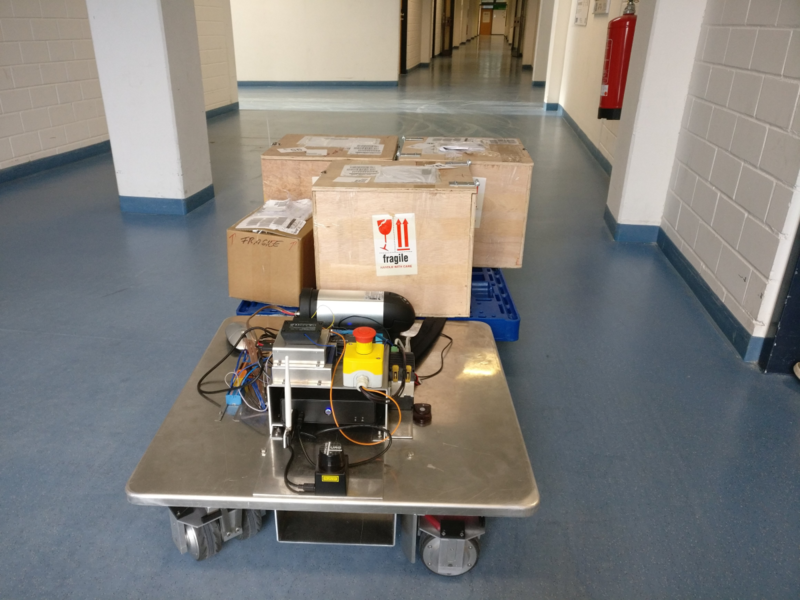 The Care-O-bot has been developed by the Fraunhofer Institute for Manufacturing Engineering and Automation (IPA) in Stuttgart, Germany. The Care-O-bot 3 is equipped with a 7 DoF manipulator, a three-ﬁngered hand and an omni-directional platform. The side-mounted tray can be flipped up to the front in order to carry multiple objects simultaneously. The sensor head contains a Stemmer CVC EH6500 HD GE/POE color camera with optical zoom, ASUS Xtion RGB-D camera and a Logitech Microphone. Two SICK S300 laser scanners and one Hokuyo URG-04LX laser scanner are used for mapping and navigation. The youBot is based on an omni-directional platform with four swedish wheels, a 5 DoF manipulator and a two finger gripper. The platform is manufactured by KUKA and is commercially available at the youBot-store. It has been designed to work in industrial-like environments and to perform various tasks as e.g. fetch & carry or assembly tasks. Hokuyo laser range finder: Two laser range finders are mounted to the base, one in the front and one in the back of the robot, to support robust localization, navigation and obstacle avoidance, especially for omni-directional movements. ASUS Xtion RGB-D camera: The RGB-D camera is mounted on a tower which is attached to the back platform of the robot. It is used for 3D scene segmentation and object recognition. Microsoft Lifecam 720p: As support for the 3D camera a color camera is mounted to the arm itself for visual servoing. High performance computer: The default internal PC with an Intel Atom CPU has been replaced by an Intel i5 dual core CPU with 2.5 GHz and 2 GB RAM. 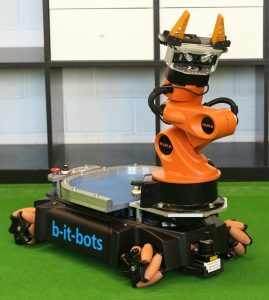 Johnny is based on a modular mobile platform called VolksBot which has been designed specifically for rapid prototyping and robot applications in education, research and industry. The VolksBot system is developed, manufactured and sold by the Fraunhofer Institute for Intelligent Analysis and Information Systems (IAIS). It allows for easy access to and replacement of components such as motors, batteries and electronics. The hardware includes a 5 DoF Katana manipulator with a two finger gripper, a SICK LMS 200 laser range finder in the front for navigation purpose, a Logitech microphone to receive commands from a human operator and a camera head consisting of a PTU-46 and ASUS Xtion RGB-D camera for object detection and recognition. The Zeno Hanson Robokind is a humanoid robot with childlike appearance. It is about 70 cm tall and can walk upright. With its 11 DoF in its head, Zeno can perform a huge sets of human-like emotions using various facial mimics. An additional microphone and two cameras (in the eyes) are used to perceive the nearby environment. 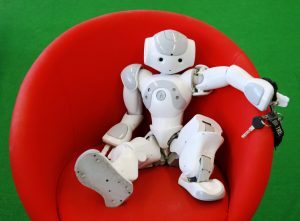 The Nao robot from Aldebaran joined the family of MAS robots in 2009. It comes with a height of 57 cm and a total weight of 5 kg. Internally, the robot is equipped with an Intel Atom CPU, two RGB cameras, a microphone and overall 21 DoF which allows flexible and comprehensive motions. With its internal battery, the Nao is able to operate up to 90 minutes independently of any external power supply. 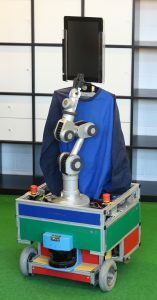 The Double robot is a telepresence system. The video of the dialog partner is shown on the attached tablet in the upper part of the robot. The partner can also remotely control the Double to move through the environment to e.g. to change the field-of-view or just to follow a person into another room. 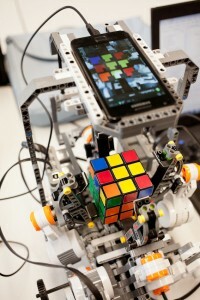 One of the first robots of the MAS group has been the Pioneer 3 mobile platform. Although it is only a four-wheeled mobile platform, it can be equipped with any accessory equipment, like laser range finders, cameras, torsos and PTUs or even a manipulator like the 5 DoF Katana manipulator. Due to its robust design, the Pioneer can not only be used indoors, but also in rough terrain of outdoor environments. Lego is usually associated with children’s toys. But with Lego NXT robots you can do more than just playing. Due to the flexible design options, complex systems can be created, such as a CubeStormer which can solve the famous Rubik’s Cube. With the large number of available sensors and actuators, many robotic applications can be realized on such a platform, e.g. navigation and localization.